Folks, I had some trouble with the address album at cletrac.org so I have change the address to use for photo submission to photos@cletrac.org . Please use that address when submitting photos for the Album on the site. Please follow the submission guidelines as far as picture size and be sure to include a description of the pictures. I haven't figured it out yet Steve. 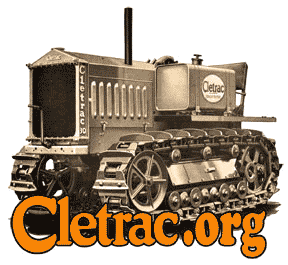 There is the "cletrac.org" at the top left corner, but it's not a hyperlink. If I figure out how to put a link, I will put one up.